The timber yurt by Echo Living. Sam Booth in his workshop. Would you live in a round house? Aside from the obvious problem of trying to find a corner in which to hide, this style of building has become extremely popular on the Pacific coast of the U.S. and Hawaii. The circular form of house is called a yurt, named by the nomads of Mongolia who have lived in them for centuries. However, unlike the woven grass variety of the nomads, or the canvas version now being enjoyed by many Californians, Sam Booth of Echo Living has created an original yurt made of timber, which is far more durable and practical for the UK climate. And despite its small size, it is quite luxurious. 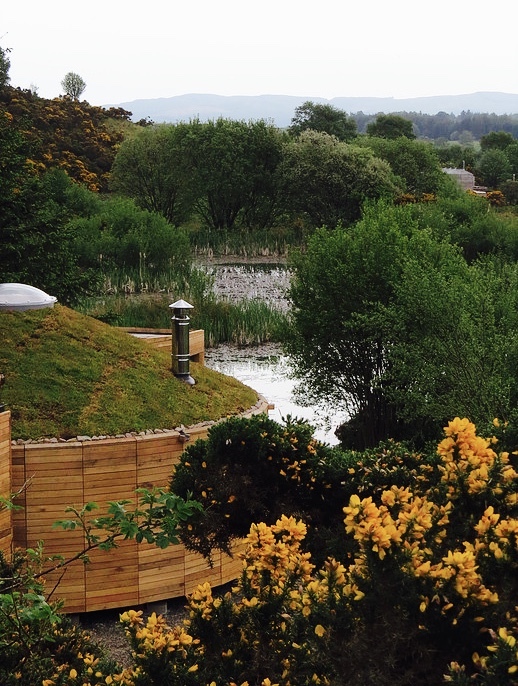 Sam, who has over 30 years of building experience, was approached by the owners of Loch Ken Eco Bothies, to create a more permanent version of the textile yurts on their property. After acquiring planning permission, Sam set about designing the yurt, which is finished with a high quality woods interior and lots of custom cabinetry and furniture elements. The result is a far more sophisticated, contemporary version of the classic yurt, which seems a natural part of its surroundings. It is also equipped with solar power as a conscious choice toward preserving the nature in which it resides. 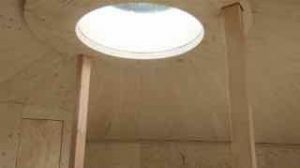 Though just 6 meters in diameter (there is an extension for the shower room and the entrance porch) the yurt feels much larger inside, partially because of the high ceiling and also the openness of the round structure. 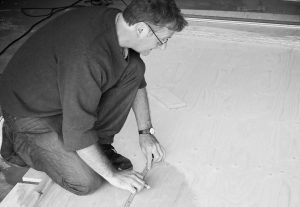 The interior is lined with spruce and the timber floor is comprised of 32 segments that have been inlaid with beech and finished with a hard wax oil finish. The ceiling of the yurt with wood sections and roof light. There are plenty of double-glazed windows which provide light and amazing vistas of the surrounding country by day and a skylight for stargazing at night. The bespoke kitchen cabinets and curved countertops made of solid Baubuche beech, emphasise the round shape of the yurt as a subtle reminder that you are in a truly unique space. In the sleeping area, there are more custom-designed pieces as a cantilevered bed seems to almost float above the floor, and drawers pull out for storage when needed, disappearing into the wall when not in use. The shower room features a rain shower and pivoting glass door, and the owner contributed a hand-painted ceramic sink with a whimsical tap. 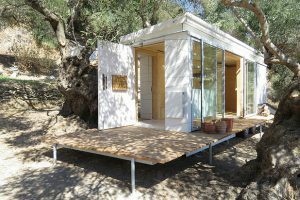 The entire structure was prefabricated in the Echo Living workshop and then divided into two symmetrical sections for delivery. Once in place on Loch Ken, the two halves were then joined together again. Though the yurt represented a new challenge for Sam, it is only the latest in a long line of innovative architectural, furniture and interior design projects. His mantra of “Build small, build smart, build beautiful,” has clearly marked him a trail blazer in the tiny house genre before it was even a genre. Sam created this tiny bespoke house on wheels with contemporary lines for a client in Crete. Sam’s clean and contemporary designs have been inspired by an early appreciation for the work of Charles and Ray Eames and other modernists. His structures and fixtures are all hand-built with an eye towards sustainable materials and frequently contain elements of playfulness and originality. Though his overall designs vary greatly depending upon the client and the functionality, there is perhaps one constant throughout; a great love and appreciation for wood. He created a viol at just 13 years of age and his passion for creating with timber has never wavered. After graduating from the Glasgow School of Art with a Bachelor of Arts in Interior Design, Sam also studied at the prestigious Mackintosh School of Architecture. Some of his more, high profile projects have included ‘Homes for the Future,’ the Rogue Restaurant in Edinburgh, which was awarded a Theme Magazine Best Restaurant UK National Award, an interior and graphic design collaboration with Barcelona’s Javier Mariscal for The Lighthouse, Scotland’s National Centre for Architecture & Design, and The Hallion Private Members Club in Edinburgh, which also won a Theme Magazine Best Interior UK National Award. His work has been featured in a number of design publications and books, and his innovative folding metal furniture collection, ‘Oritetsu’ has achieved international recognition and been purchased by the Museum of Modern Art, New York. To see more of Sam’s work visit EchoLiving.co.uk. To visit one of his creations, visit LochKenEcoBothies.co.uk.